It does kill the nasty bollworm. What about friendly microbes? transgenic crops come with a range of biosafety concerns, which are contested because the discussion of such crops is highly polarized. Researchers of the Indian Agriculture Research Institute (iari), in a recent study, said Bt-cotton may affect soil microbes and nutrients available to the plants. "The Bt toxin has the potential to enter the soil through root secretion and from decaying roots where it comes in direct contact with soil microbes," said Keshav Raj Kranthi, senior scientist at the Central Institute for Cotton Research in Nagpur. Bt cotton has the genetic sequence called cry1Ac, which produces the Bt toxin that kills bollworms, serious cotton pests. While Bt bacterium occurs naturally in soil (about 0.25 grammes per hectare), transgenic Bt crops increase the Bt toxin amount (to 650 grammes per hectare), the study said. The iari researchers compared the behaviour of microbes in soil under Bt cotton varieties and non Bt cotton varieties, both developed by Mahyco Research Centre. In the experimental setup, they grew the crops in porcelain pots and applied urea and phosphate nutrients. They found lower activity of certain soil enzymes (called dehydrogenase) in the soil growing Bt cotton compared to that with non-Bt cotton. Dehydrogenase enzymes indicate microbial population in soil; a drop in their activity means partially inhibited microbial activity, the study said. "Higher Bt toxin concentration in the root zone of Bt cotton plant could have made conditions unfavourable for certain groups of microbes," said T J Purakayastha, one of the authors of the paper published in the Journal of Agronomy and Crop Science (Vol 194, No 04). The study also found lower soil respiration rate in Bt cotton soil. Soil respiration is another indicator of biological activity, including that of soil microbes. The researchers were not sure of the process in which the Bt toxin may affect microbial activity. It could be due to changes in the root secretions important to soil microbes, they said. This, in turn, could be due to changes in the composition of substances found in plants. In terms of nutrient availability, the study found Bt cotton soil had lower mineral nitrogen than in non-Bt cotton soil. 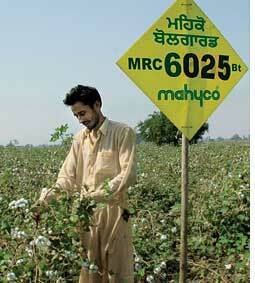 The researchers said Bt cotton has the tendency to take up more nitrogen compared to non-Bt cotton. Several factors affect nitrogen availability in soil during the cotton plant's growth. For example, its nutrient demand is the highest when the cotton bolls are in the formation stage; this stage leaves less nitrogen in the soil. The study did not find any significant difference in the boll formation--or their weight--in both the cases. So they ruled out the possibility of the difference stemming from the higher nitrogen uptake during boll formation. "While there was no incidence of bollworm attack either on non-Bt or Bt cotton setup, nitrogen-deficient soils under Bt cotton may have restricted better performance," said Purakayastha. Reduced microbial activity could have also affected nitrogen availability in soil as the microbes make nitrogen available to plants, the scientists said. "In similar studies, we didn't find significant difference in microbial activities in soils of central India," Kranthi said.